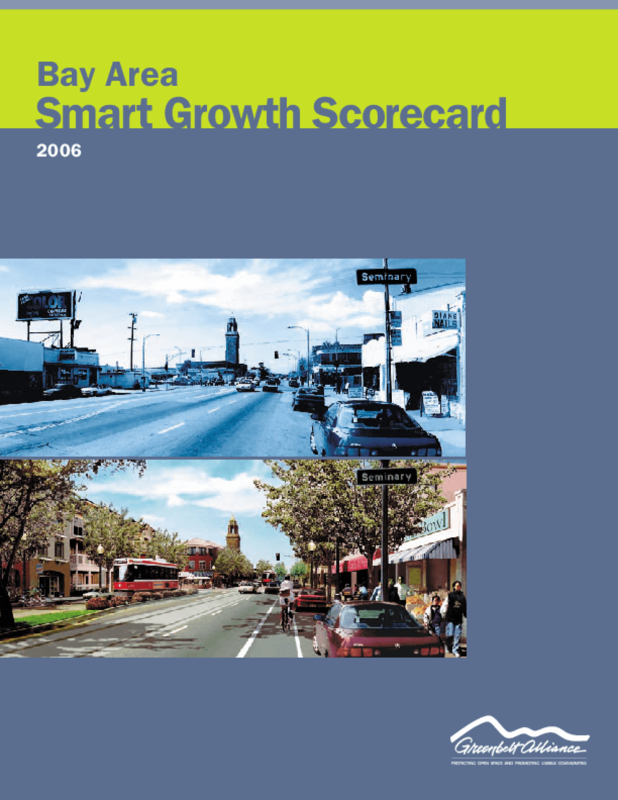 The Bay Area Smart Growth Scorecard is a landmark assessment of the planning policies of all 110 cities and counties of the San Francisco Bay Area. Although a city's current development is apparent to anyone who visits it, the policies that guide a city's future development are not so obvious. The Smart Growth Scorecard provides the first view into these policies and the first comparison among them. preventing sprawl; making sure parks are nearby; creating homes people can afford; encouraging a mix of uses; encouraging density in the right places; requiring less land for parking; defining standards for good development. On average, Bay Area cities scored 34% (of a possible 100%), meaning cities are doing only a third of what they could be to achieve smart growth. managing growth; permanently protecting open space; preserving agricultural land; conserving natural resources; and offering transportation choices. On average, Bay Area counties scored 51%. The scores are low overall. But in every policy area, at least one city or county is doing well, whether it is a city that is encouraging walkable neighborhoods, or a county that is preserving its agricultural land. The Association of Bay Area Governments estimates that Bay Area will have one million additional residents by 2020; the Smart Growth Scorecard evaluates how well all the region's jurisdictions are planning for that growth, and how they can do better. Copyright 2006 Greenbelt Alliance. All rights reserved.